Two US troops and two civilian personnel were among 16 people killed by an Islamic State bombing in northern Syria on Wednesday. The suicide attack in Manbij in western Aleppo Province could complicate Donald Trump’s December 19 order for the withdrawal of all 2,000 American military personnel from Syria. Trump said that the troops can be removed because the Islamic State has been “completely defeated”, but US agencies have pushed back, warning that ISIS — while reduced to a pocket of territory along the Iraqi border in eastern Syria — can still carry out operations. Hours after the attack, the US military confirmed the deaths of the four Americans and said three troops were wounded. ISIS claimed responsibility through its outlet Amaq. A Pentagon spokeswoman said that only two US troops have previously been killed in action in Syria. There have been two non-combat fatalities. 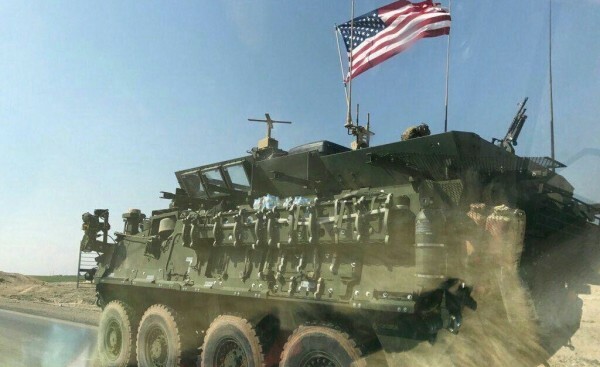 US and Turkey agreed last summer to patrol Manbij, a mainly-Arab city taken from ISIS by the US-supported, Kurdish-led Syrian Democratic Forces in August 2017. The arrangement has been under pressure from Turkey’s Erdoğan Government, which has criticized Washington for not ensuring the withdrawal of the Kurdish militia YPG from the area. Syria Daily, Dec 30: Turkey & Russia Agree “Coordination” After US Leaves — But What About Manbij? Here's @VP Mike Pence proclaiming proudly and unequivocally today — mere hours after a bombing in Syria that ISIS has taken credit for killed at least 4 American troops — that "ISIS has been defeated." As we begin to bring our troops home, the American people can be assured, for the sake of our soldiers, their families, and our nation, we will never allow the remnants of ISIS to reestablish their evil and murderous caliphate. Turkey, which has been trying to split Trump from US officials like Bolton, also maintained the call for American departure. President Recep Tayyip Erdoğan said he did not believe the attack would affect the order for withdrawal “because I saw honorable Trump’s determination on this point”. Trump did not mention the American deaths in his Wednesday comments. The US government believes the Islamic State militant group is likely responsible for Wednesday’s attack in northern Syria that killed four Americans, although it has not reached a firm conclusion, two US government sources said on Thursday (January 17). Responsibility for other attacks in Manbij has similarly been difficult to assign. A March roadside bombing in the area killed a U.S. Special Forces operator along with his coalition comrade from the United Kingdom. The attack came shortly after a spokesperson for the Manbij Military Council (MMC), an affiliate of the Syrian Democratic Forces reportedly struck alongside U.S.-led coalition forces in Wednesday’s attack, was targeted in an assassination attempt later claimed by a suspected Turkey-backed Syrian rebel group. These attacks came in the aftermath of Trump’s previous announcement that he intended to withdraw from Syria. The first British soldier to be killed in Syria during an undercover mission in Manbij on Thursday [March 29] against the Islamic State (ISIS) might have lost his life because of a bomb planted by Turkey backed Free Syrian Army (FSA) forces according Special Air Service (SAS) sources wrote the Mail on Sunday. A U.S. soldier was also killed during the same mission and Pentagon confirmed to the Daily Mail that “the incident is the subject of a military investigation”. The Mail on Sunday noted that if the military investigation concludes that FSA backed by Turkey was behind the blast, this “could lead to a diplomatic row with Turkey, a Nato member”.